OXON HILL, MARYLAND – MGM National Harbor is a recently opened resort in National Harbor, Maryland that includes a 23-story hotel with 308 guest rooms, retail space, a spa, seven restaurants, 27,000 square feet of meeting and event space, a 3,000-seat theater with seven VIP suites and a casino with 135,000 square feet of gaming space. When it was time to design a sound system for the facility, the casino proved to be the most challenging area. With separate sections for slot machines and table games such as poker, blackjack, craps and more, each gaming area has a unique atmosphere and different audio requirements. For example, the music near the poker tables needs to be much quieter than the slots area, since the poker players need to concentrate and communicate clearly during games. 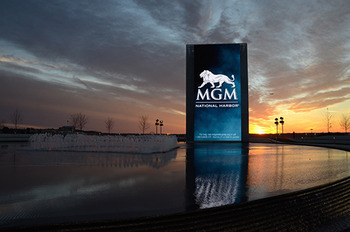 In order to meet these challenges, MGM hired audiovisual design and installation specialist Technology West Group to create a networked audio system for the casino that would enable flexible and independent volume control across a wide range of audio zones—while also requiring minimal training and maintenance for staff. Leveraging years of experience with casino audio systems, Technology West Group designed and implemented a complete audio system by HARMAN Professional Solutions consisting of JBL Control 300 Series speakers, Crown DCI Series amplifiers and BSS networked audio systems. In the past, casinos typically relied on a traditional audio system design made up of a series of high-powered amplifiers driving a chain of 60-70 speakers. This approach provides even audio coverage across the entire gaming floor, but also poses several problems. Casino staff have no way of adjusting the volume for different gaming areas, so the music may be too loud in one area and too quiet in another. Furthermore, casino floor layouts are often rearranged annually, and any adjustment to the audio system usually requires major renovations.